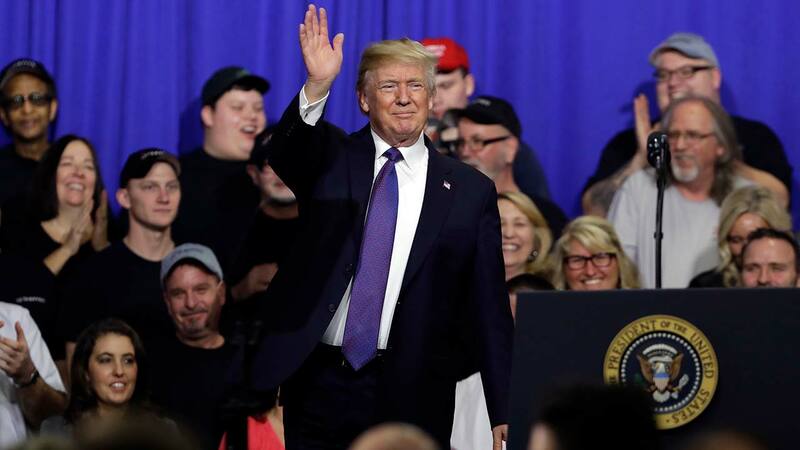 BLUE ASH, Ohio -- President Donald Trump accused Democrats on Monday of being "un-American" and perhaps even "treasonous" for refusing to cheer positive news during his State of the Union address, as he turned an appearance arranged to promote new tax cuts into a session bashing the political opposition. Even as Trump celebrated the tax cuts and the economy, the Dow Jones Industrial Average took a wild ride during his nearly hour-long speech, falling more than 1,000 points, recouping some losses, then falling again. Trump has frequently commented on gains in the market during his first year in office, but he remained silent about the day's gyrations during his appearance at an Ohio company that makes cylinders. Trump and his wife, Melania, made it a his-and-hers domestic policy day. The first lady accompanied the president to Ohio, but she peeled off to visit Cincinnati's children's hospital to be briefed on the opioid epidemic while he pitched the tax cuts he signed into law just before Christmas. During what turned into a wide-ranging speech, Trump criticized House Democratic leader Nancy Pelosi for describing as "crumbs" the bonuses of $1,000 or more that some companies, including the one he spoke at, are giving their workers as a result of the tax cuts. He also accused Democrats of being "un-American" for not clapping during his address to the nation last week, in contrast to fellow Republicans, who Trump said were "going totally crazy wild" over everything he said. "They certainly didn't seem to love our country very much," the president said. As for Pelosi, who represents San Francisco, Trump said, "She's a rich woman who lives in a big beautiful house." He said the "crumbs" remark was not a "good day" for Pelosi, whom he referred to as the Republicans' "secret weapon." Pelosi responded on Twitter, writing: "Every American should be alarmed by how realDonaldTrump is working to make loyalty to him synonymous with loyalty to our country. That is not how democracy works." Trump also predicted that Republicans will do well in November's congressional elections.